Whether you are a first-time or long-time dog owner, “Good Dog!” is the book to keep readily at hand. 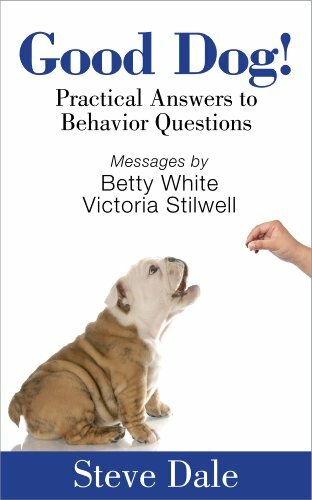 Author Steve Dale, a certified animal behavior consultant and syndicated columnist on pet behavior, provides insights, tips, and tools for handling all range of behavior issues. “Good Dog!” tackles some of the most common and difficult behaviors, using positive reinforcement to correct them. Written with pet owner questions and answers from Dale’s columns, “Good Dog!” covers such topics as dogs’ aggression–towards people or each other; training challenges; noise and separation anxieties; curbing excessive barking, jumping, or chewing; and cognitive dysfunction. A section on unusual topics gives advice on everything from bringing home new pets and people to how to handle a reluctant pooch’s costume on Halloween. This is the perfect book for any dog owner whether they have a problem or perfect dog. The author provides wonderful insights and ideas to help understand your pet a bit better. Written in a question and answer form, this easy to follow guide will help you find the issue easily and comprehend what your is happening with your dog. It covers everything from aggression to training in friendly and conversational articles that should help with even the most difficult problem. I have a dachshund and they are notoriously difficult to train. She is actually well behaved but she still has a few issues I want to correct. With fragile backs, dachshunds shouldn’t jump and I bought her doggie stairs to help her move from the bed to the floor since she loves to take a flying leap off the top. She would not have anything to do with these stairs, so I used Dale’s method of positive reinforcement and she now bounds up and down them with ease. There are lots of other helpful insights and tips into dog behavior as well as the usual potty and leash training tips.